We, citizens who oppose the civil and military use of atomic energy, are working for No Nukes World Social Forum (a Thematic World Social Forum on nuclear energy) to be held in March 2016, in Japan. We started the discussion on a Thematic World Social Forum on nuclear energy in October 2014 and we decided to hold it at the international preparatory meeting during WSF Tunis 2015. We intend to make this forum as our first efforts to link with the global movement for a world without nuclear power plants and nuclear weapons. No Nukes WSF will be organized on the principles and experiences of WSF process. WSF has been playing an important role as a global movement for “Another World” without poverty and war, opposing neo-liberal globalization and “a war against terrorism”. This forum intends to extend the experiences of WSF process in order to link with the movement for a world without nuclear power. Even when nuclear power plants are operating without any catastrophic accidents, they are harmful because they involve exposure of workers, nuclear waste disposal for several hundreds of thousand years, and environmental pollution. In addition, they can be used for providing fuel for nuclear weapons. Nevertheless many countries intend to build nuclear power plants as alternative energy sources under the guise of resolving climate changes. This trend will expand the nuclear threat in the military and security field. In order to realize global peace and resolve poverty and disputes, we must break dependence on nuclear power, build the alternative society without dependence on arms or moneymaking, and protect the right to life of all the people. No Nukes World Social Forum will be the space for discussing these issues and planning activities. We call for you to join No Nukes WSF 2016. Japanese people suffered atomic bombs in Hiroshima and Nagasaki in 1945 and even after the end of WWII, fishermen of The Fifth Fukuryumaru were exposed to radiation from US’s H-bomb test. Despite of these experiences, Japan has been promoting the utilization of nuclear energy and has become the world's pre-eminent “Nuclear developed country.” Furthermore, in spite of serious damage by the Fukushima nuclear disaster in March 2011, Japan is still trying to restart the operation of nuclear power plants and promoting the export of them. 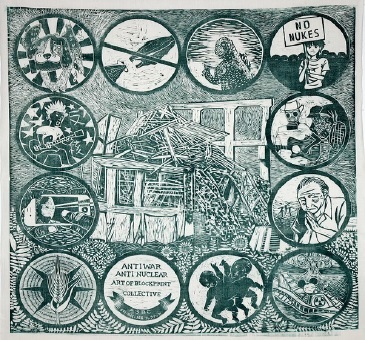 In order to realize global peace and resolve poverty and disputes, we must break dependence on nuclear power, build the alternative society without dependence on arms or moneymaking, and protect the right to life of all the people. No NukesWorld Social Forum will be the space for discussing these issues and planning activities. We call for you to join No NukesWSF 2016.